← LAD Meeting: Wednesday, May 2! LAD Meeting: Wednesday, June 6! 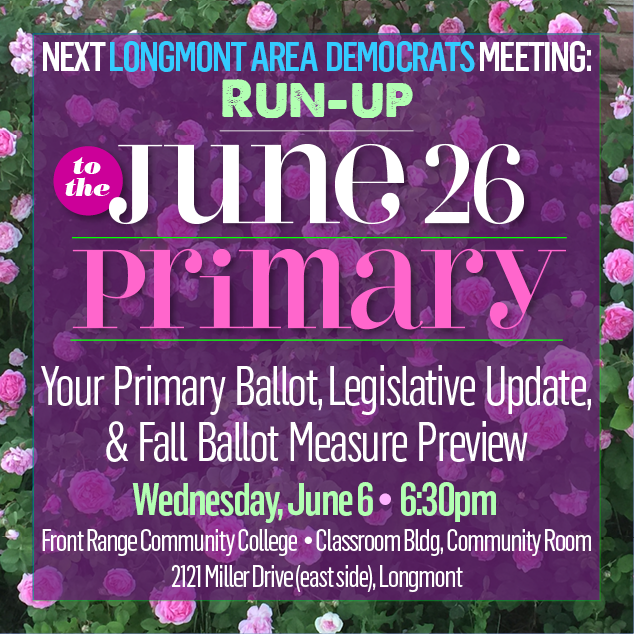 YOU DON’T WANT TO MISS our next meeting: where else will you get a comprehensive overview of your PRIMARY (June 26) ballot, but the very place that introduced you to the candidates ON that ballot? We had an exciting, frustrating — yet productive Colorado legislative session (it ended May 8). We’ll have State Reps Jonathan Singer (HD11) and Edie Hooton (HD10) on hand to tell us the inside story on the bills they fought for. Reminding us that MAJORITIES MATTER (thus our upcoming PRIMARY, June 26). Your primary ballot will be mailed to you this week from the Clerk’s office. Come to our meeting, we’ll walk you through and have discussion about the parts you might not be familiar with. We’re here to help. PLUS, we’ll offer a SNEAK PREVIEW of the Fall ballot measures to keep an eye on — WHAT PETITIONS NOT TO SIGN (they can be sneaky)! ALSO, POSTCARDS: let’s remind Cory Gardner and Ken Buck that $3.8 million & $800,000 from the NRA IS A VERY BAD IDEA. Be sure to check your voter registration at govotecolorado.com to make sure your address is current. You must be a Colorado resident by June 4 in order to vote in this primary. June 18 is the last day to request a replacement mail ballot or register to vote and be sent a ballot in the mail. But remember, you can register to vote on any day, including Election Day, and if you do so after June 18, you can still fill out your ballot at a Voter Service Polling Center. If you are an unaffiliated voter, and you did not make a preference for what ballot to receive (preferred date was May 8, but click the link in this paragraph for more info), you will receive 2 ballots — but only fill out one ballot! If both ballots are marked in any way, your vote will be invalid. For more information about unaffiliated voting, including a video, go here. Comments Off on LAD Meeting: Wednesday, June 6!